Nicki Jhabvala of the Denver Post has reported that Denver Broncos defensive end Derek Wolfe is “75-80%” recovered from the ankle sprain that has kept him out of training camp, and will be ready for the season opener against the Los Angeles Chargers. Wolfe enjoyed a breakout year in 2015, where he ended the season ranked ninth of 113 interior linemen with a PFF overall grade of 88.8. He excelled against the run all season, and ended the campaign ranked first among all 3-4 defensive ends with a run stop percentage of 13.0 percent. 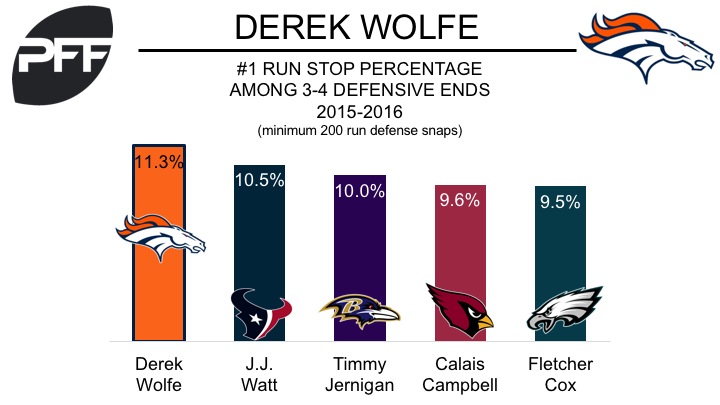 Wolfe carried his dominance against the run over to 2016, and ended the 2016 season ranked second among 3-4 defensive ends with a run stop percentage of 9.6 percent. Wolfe has not just been effective against the run, he’s also been extremely productive as a pass-rusher. Over the last two seasons, Wolfe has accumulated 14 sacks, the third highest mark among the league’s 3-4 defensive ends. His 78 total pressures (combined sacks, hits and hurries) ranks ninth.